Gjerde, J.M. 2010. Rock Art and Landscapes: Studies of Stone Age Rock Art from Northern Fennoscandia. Tromsø: University of Tromsø. Helskog, K. 1985. Boats and Meaning: A Study of Change and Continuity in the Alta Fjord, Arctic Norway, from 4200 to 500 Years BC. Journal of Anthropological Archaeology, 4:177–205. Helskog, K. 1987. Selective Depictions: A Study of 3700 Years of Rock Carvings and their Relationship to the Sami Drum. In: Hodder, I., ed. Archaeology as Long Term History. Cambridge: Cambridge University Press, pp. 17–30. Helskog, K. 1999. The Shore Connection: Cognitive Landscape and Communication with Rock-Carvings in Northernmost Europe. Norwegian Archaeological Review, 32 (2): 73–94. Helskog, K., ed. 2001. 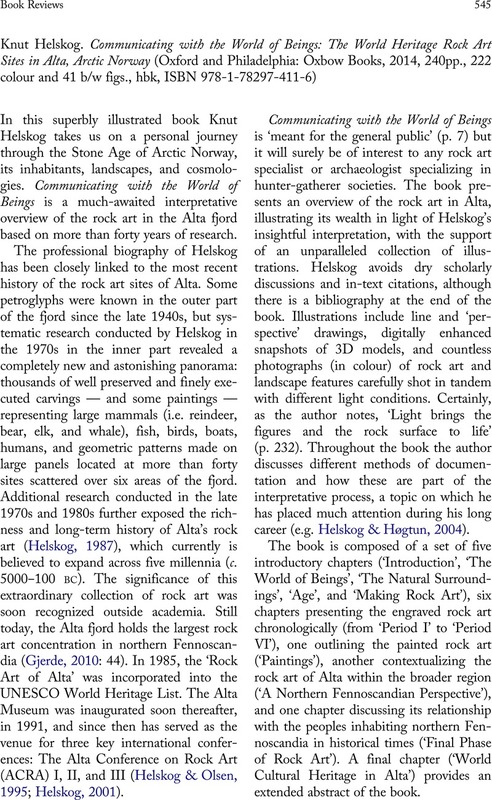 Theoretical Perspectives on Rock Art Research. Oslo: Novus forlag & The Institute for Comparative Research in Human Culture (ACRA, Alta Conference on Rock Art). Helskog, K. 2004. Landscapes in Rock Art: Rock Carvings and Ritual in the Old European North. In: Chippindale, C. & Nash, G., eds. The Figured Landscapes of Rock Art: Looking at Pictures in Place. Cambridge: Cambridge University Press, pp. 265–88. Helskog, K. & Høgtun, E. 2004. Recording Landscapes in Rock Carvings and the Art of Drawing. In: Milstreu, G. & Prøhl, H., eds. Prehistoric Pictures as Archaeological Source/Förhistoriska bilder som arkeologisk källaTanumshede. Göteborg: Tanums Hällristningsmuseum (Gotarc Serie C. Arkeologiska Skrifter 50), pp. 23–31. Helskog, K. & Olsen, B., eds. 1995. Perceiving Rock Art: Social and Political Perspectives. Oslo: Novus forlag & The Institute for Comparative Research in Human Culture (ACRA, the Alta Conference on Rock Art). Olsen, B. 2012. After Interpretation: Remembering Archaeology. Current Swedish Archaeology, 20:11–34.